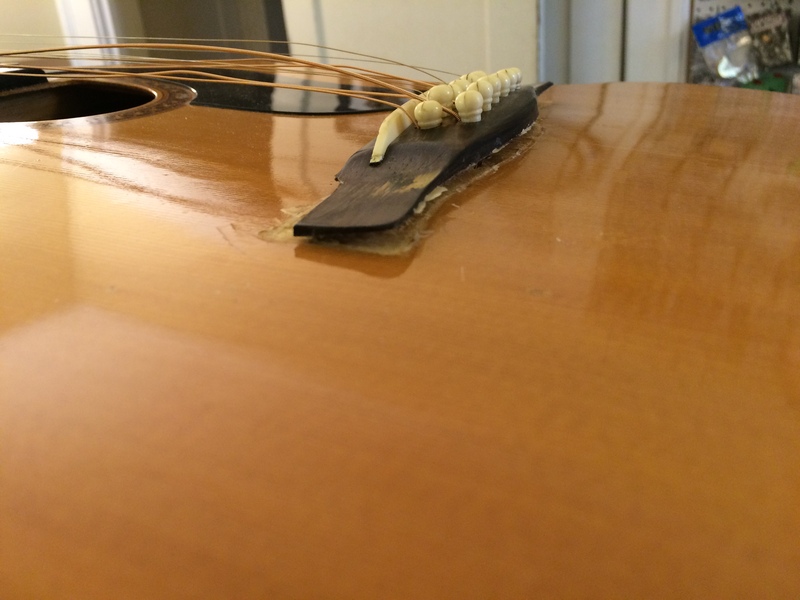 A customer brought in this ’70s Giannini 12-string that was in need of a rescue. As you can see, there are some problems at the bridge, compounded by a bad repair job that failed. A quick look inside showed that the bridge plate was cracked, and you can see that the bridge is barely holding on by the front edge. 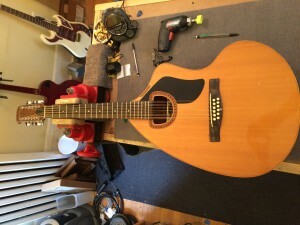 The customer’s budget added to the challenge, as did the ridiculously small soundhole. I could barely get my hand inside, and even when I did, there wasn’t enough room to work. 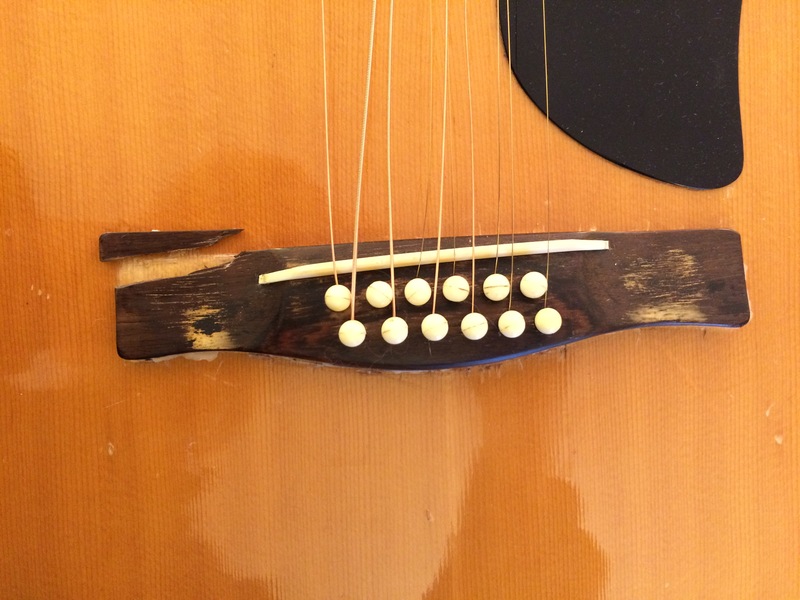 If I had to guess, I’d say that the heavy tension of 12 strings caused the belly to form and the bridge plate to crack, which eventually caused the bridge to come loose. Someone did a poor job of trying to reglue it, which caused it to come loose again, and this time it took some finish with it. You can get an idea of how bad the belly is. Bending the bridge caused a corner to break off. The first step was to remove the bridge without making the problem worse. It came off quickly, but the wood underneath was already damaged so a couple of big chunks came off with the bridge. The next step was to use a set of Thompson belly reducing cauls to flatten the top. 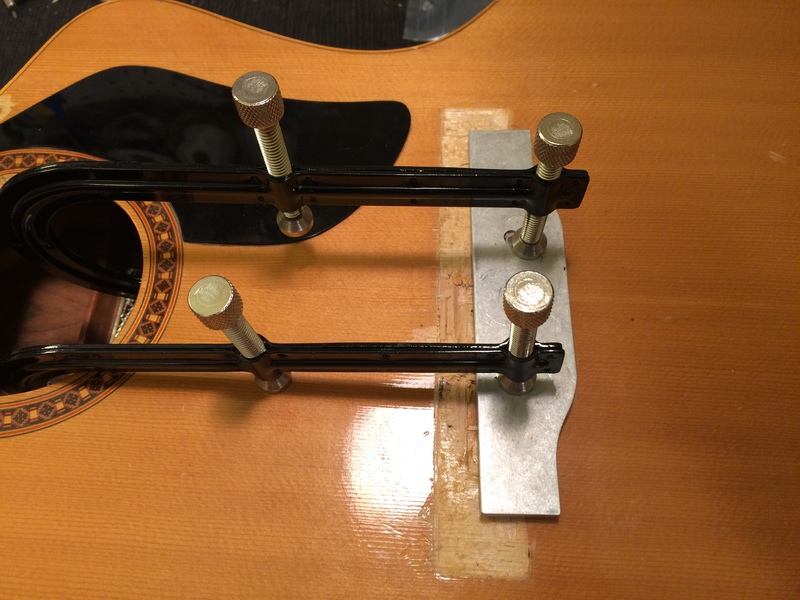 It’s pretty straightforward: you just get them hot (I do it by dunking in hot water), and then clamp the matching set on the top and bottom of the bridge area. 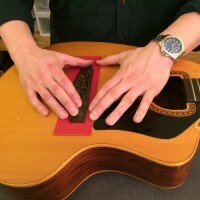 The small soundhole made it a bit of a headache. It took several tries, magnets, and help from my fiancée to get them in place. 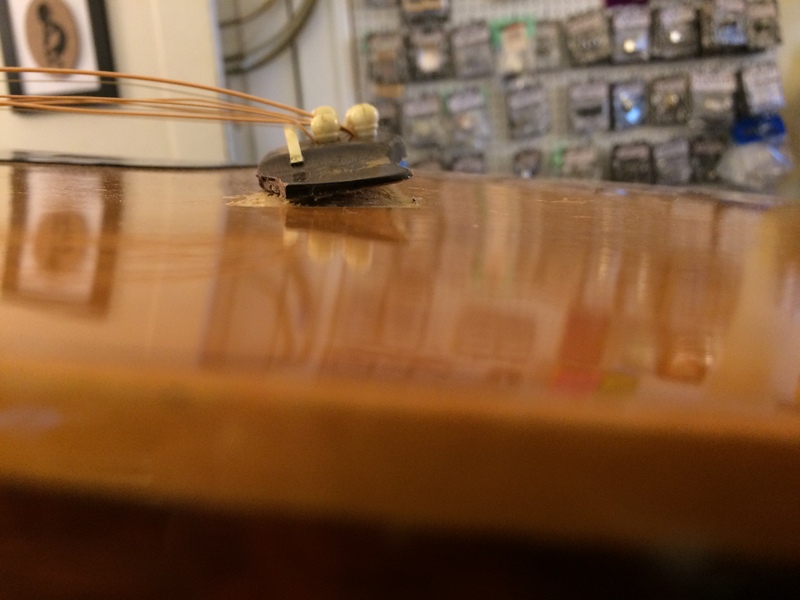 Since I also wet the soundboard, I left it clamped overnight to dry fully. After that, the top was pretty much level. 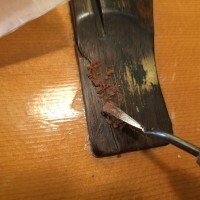 Carefully removing the bridge with a palette knife. Using the Thompson belly reducing cauls to flatten the top. The bridge itself was unevenly arched and didn’t match the shape of the top. I flattened it with some razor files, then sanded it to shape by placing sandpaper over the bridge location. 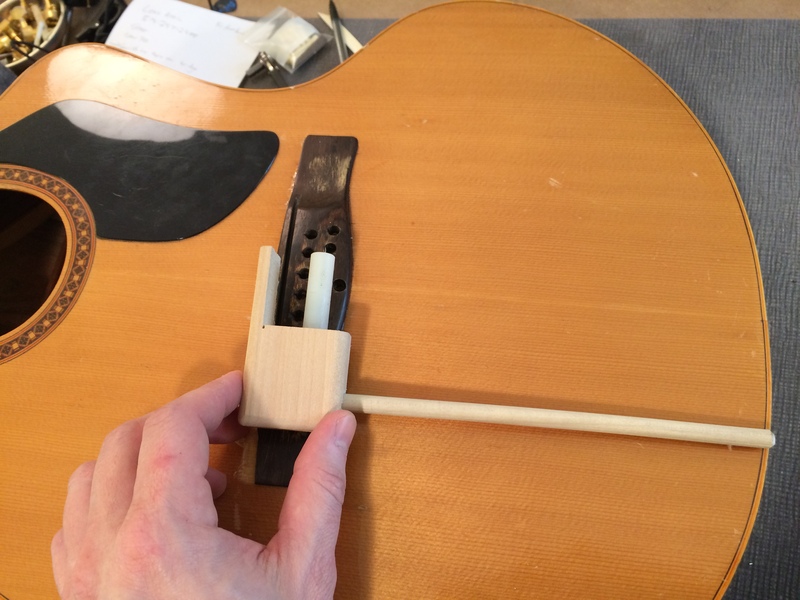 In a few minutes the bottom of bridge was the same shape as the top, which will help it stay glued in place. 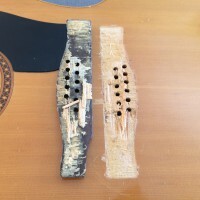 Before gluing the bridge, I filled the existing string holes with some wax to keep the glue from dripping inside the guitar, and to keep the holes from getting plugged with glue. I figured it would save more time later, and it did. 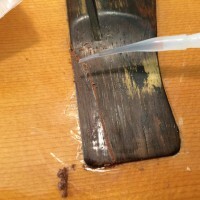 After the glue dried, I pushed the wax out from the inside with a bridge pin, and then a couple of turns with a reamer to clean up the holes. 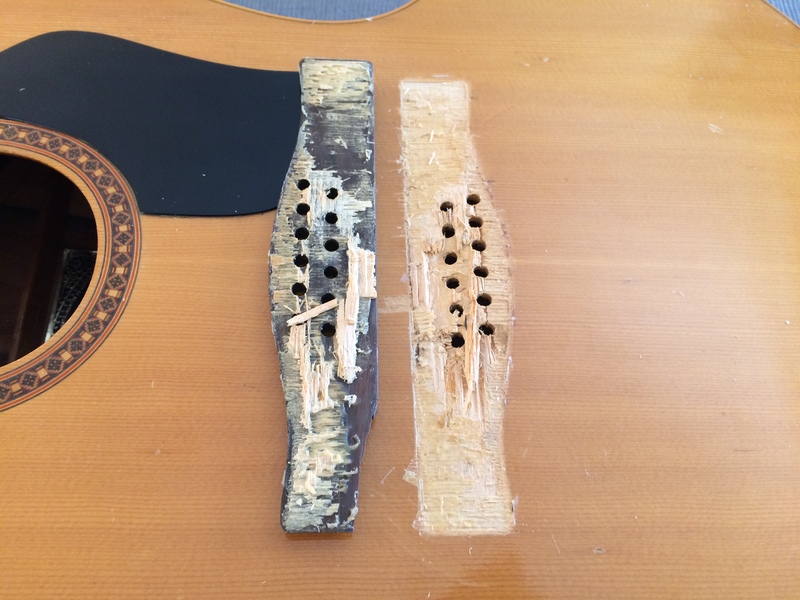 There was enough damage to the soundboard that I had to think carefully about how to repair it. 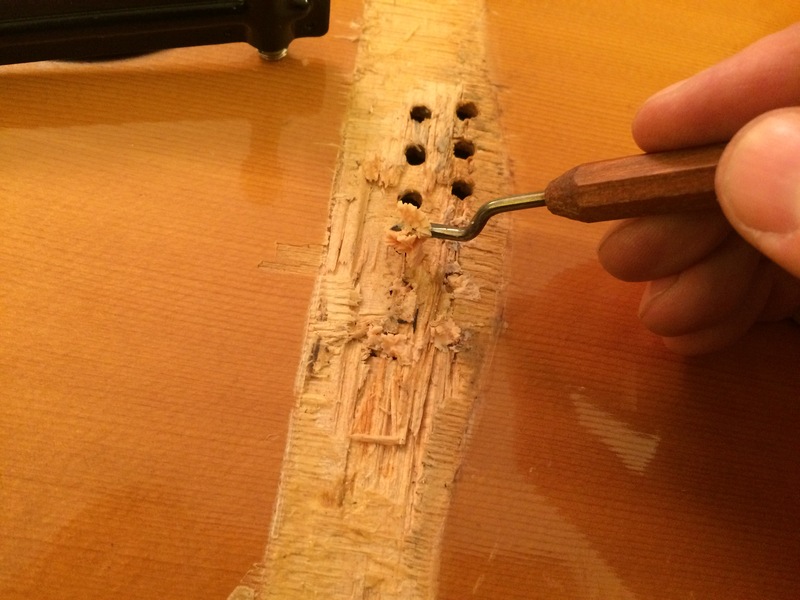 With a bigger repair budget, I would have routed out the damaged wood and patched in a new piece of spruce, and if this were a valuable guitar I would have insisted on it. Since it was a family player, though a less costly approach was needed. 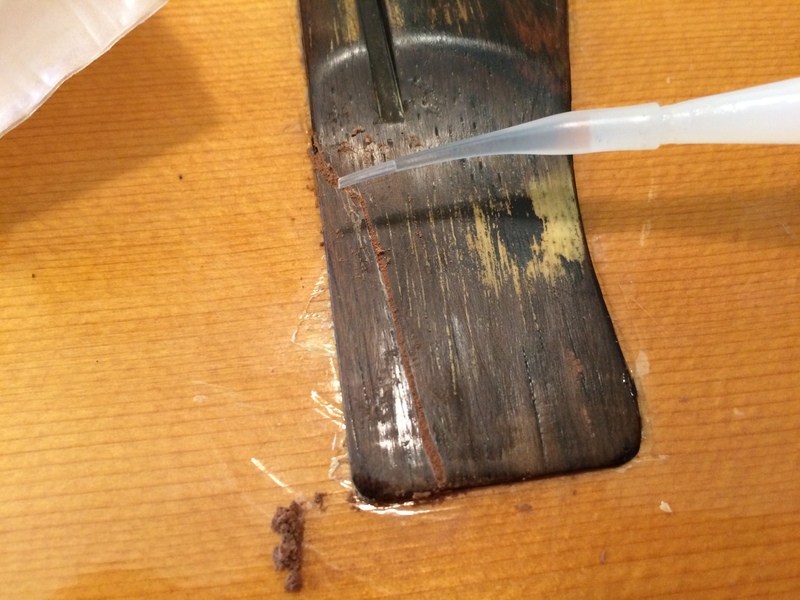 I finally settled on using a 2 part epoxy because of its ability fill in the gaps without losing strength. I test fit the clamps and got the cleanup tools ready before I started with the glue. 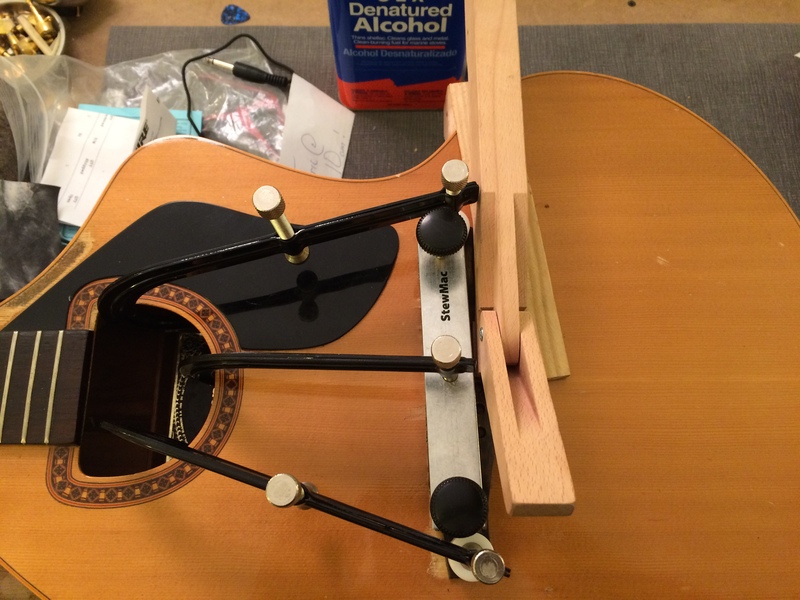 Even with a specialty bridge clamp, I needed a few other clamps as well. The wings on the sides needed their own clamps, and I added a cam clamp to the back of the bridge to even out the clamping pressure It came out well, though I did need to wick in some extra glue at the front edge after removing the clamps. 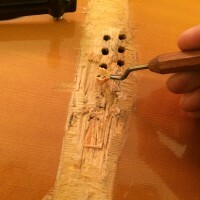 Sanding the bridge to fit the shape of the top. 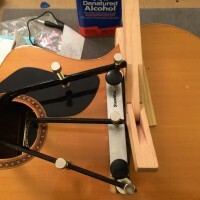 Clamping the bridge after gluing. Fitting a Bridge Doctor was the only practical way to make sure that the belly stays flat and keeps this all from happening again. 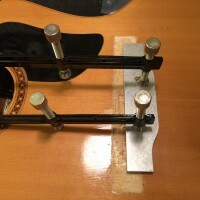 It sits against the bridge plate underneath and is screwed in place. 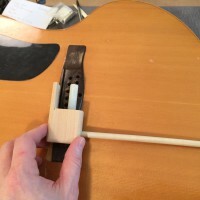 The long dowel pushes against the tail block, adding a lot of support to the bridge. 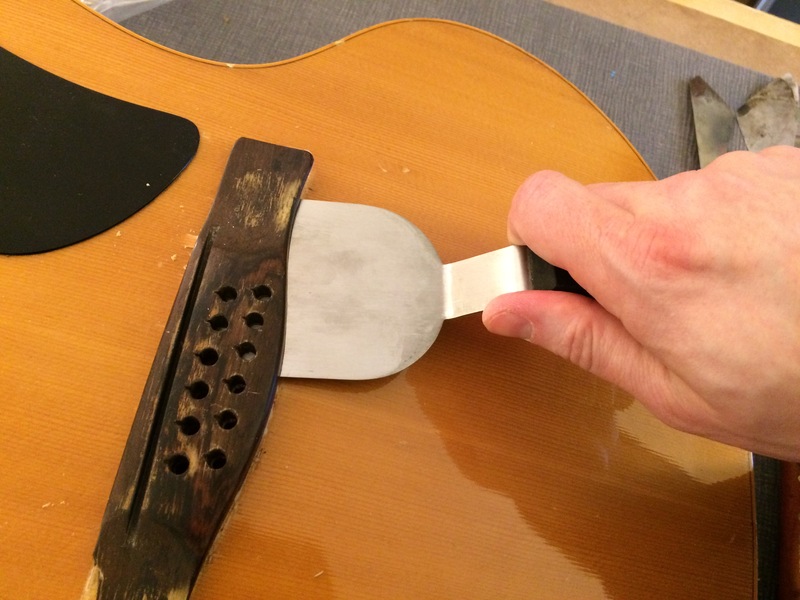 It’s a bit of a brute force solution, but it’s also super practical and rock-solid. Since it only requires about half an hour of labor to install, it’s an affordable solution as well. 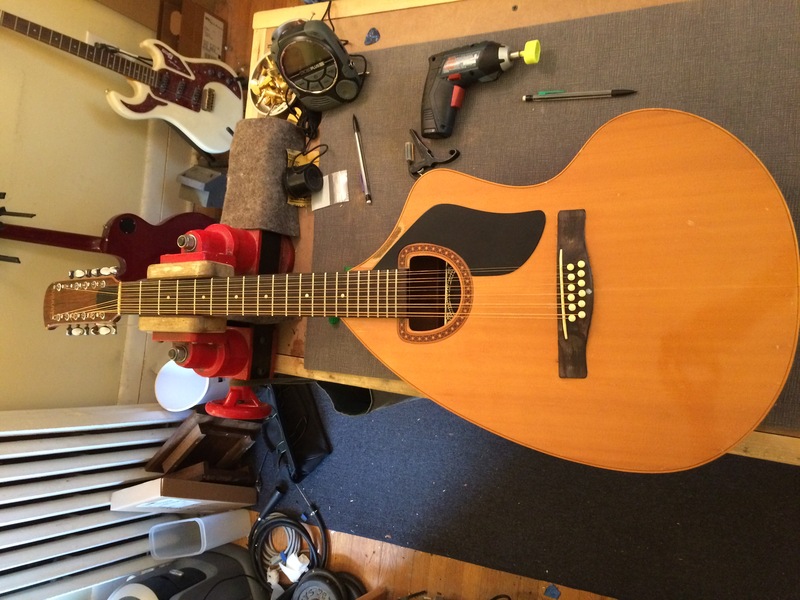 I measured everything outside of the guitar and trimmed the dowel to fit before installing. The little piece of the bridge wing that broke off didn’t quite fit perfectly, so a little patching was needed to blend it in. 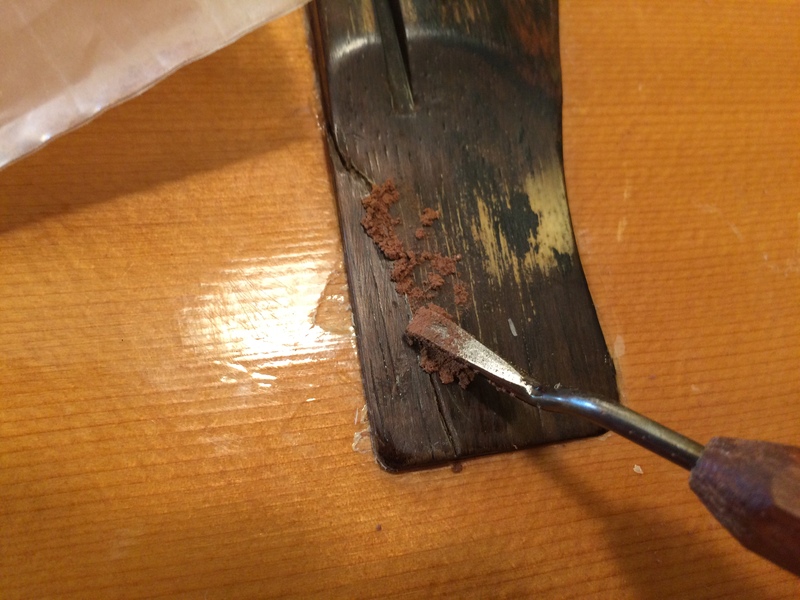 I packed the joint with some rosewood sawdust and then applied thin CYA glue. After it dried, I scraped it level with the surrounding wood, then sanded it smooth. 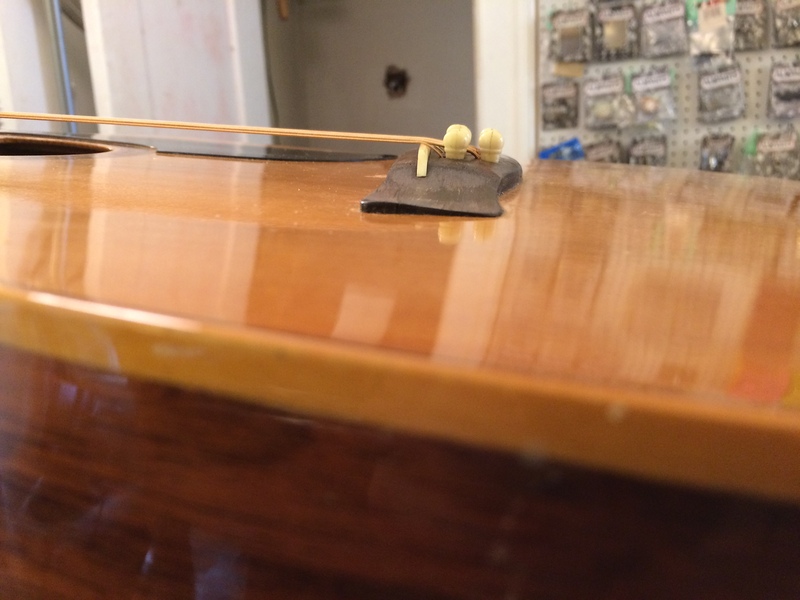 I also scraped off whatever that old finish was that had separated from the wood and yellowed over time. It made the bridge look new and the patch can only be seen up close. Rough measuring the Bridge Doctor installation before installing. 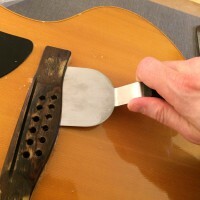 Fixing the sawdust in place with CA glue. After scraping and sanding, it’s nearly invisible. 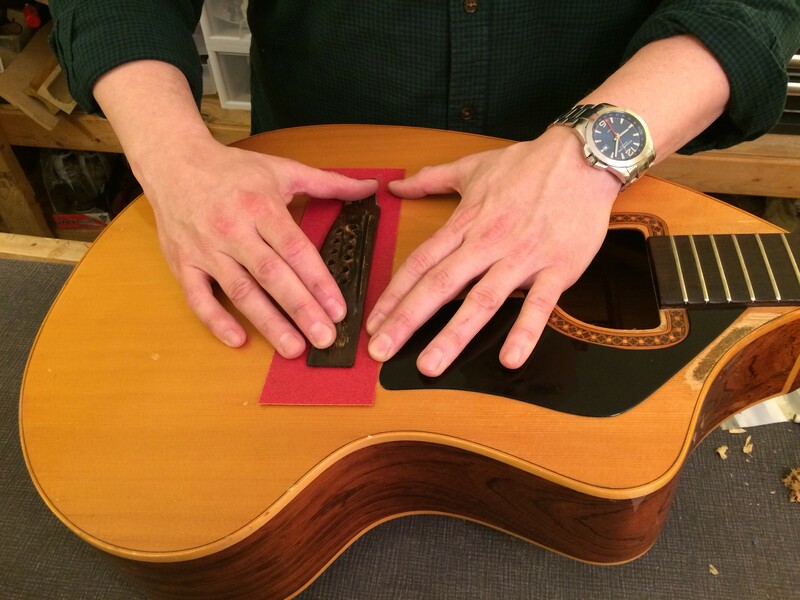 The moment of truth: stringing it up to pitch. Not only did everything hold, but with just a couple of tweaks to the setup it played really nicely as well. The owner was excited to have her old baby back! Strung to pitch. After a couple of setup tweaks, it played great! 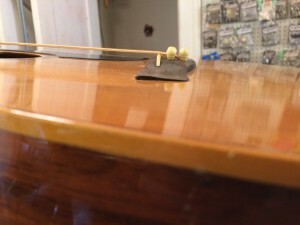 At full string tension, the top has exactly the right belly shape.